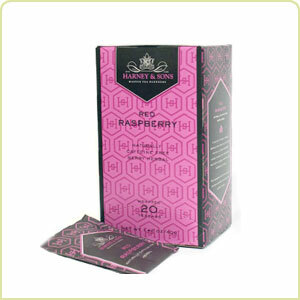 Harney & Son's Red Raspeberry Decaf tea. This tisane is a mixture of rosehips, hibiscus, raspberry leaves and raspberry flavor that produces a great tasting, great looking tea. 20 per box. Each teabag brews a 6 to 8 oz cup. Caffeine free, herbal, Kosher.